Surprisingly, the truce brokered by Madhav between factions and interest groups—some trying to protect Rushdie and others aiding and abetting the apostate’s assassination—held for many years. Every morning I stood at the Bamboo Villa bus stop in central Calcutta for my office, a beggar at the footpath used to salute me in gesture. Poetry, which makes its appeal through heightened language, has restricted audience, especially in the new era of science and technology. Most poetry in the poetry books written by poets in India in the past few years can be mainly put into two categories. CLRI in Digital Formats CLRI is released in more than 10 digital formats and is available with almost all eStores worldwide to suit readers from all walks of life. Call for Submission CLRI wants to add some more columns to its issues so CLRI seeks submission in poetry, stories, arts, photography, designing, modeling, film reviews, book reviews, essays, criticism etc. Buy Print Edition of CLRI with eBay. 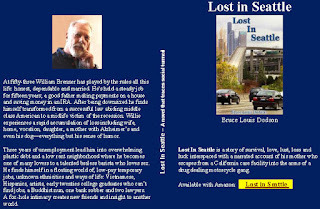 Lost in Seattle - A novel that traces social turmoil that started with economic recession in America in 2008 and impacted the society for ever. Categories: Poetry, Fiction and Life Writing - 3000 words max or 5 poems max. Deadline - 5pm GMT on 27 July 2012. Prize - £300 per category and publication in Wasafiri. The Wasafiri New Writing Prize is open to anyone worldwide who has not published a complete book and we are looking for creative submissions in one of three categories: POETRY, FICTION and LIFE WRITING. The fee for entry varies depending on the number of categories you wish to enter and ranges from UK Sterling £6 to £15. The closing date is 5pm GMT on 27 July 2012. The winners will receive £300 each and their work will be published in Wasafiri. Submission is through filling an entry form. Download the Entry Form from: www.wasafiri.org/wasafiri-new-writing-prize.asp. However you can send us an email for enquiries. Always address your email to wasafiri@open.ac.uk and keep writersdeskinfo@yahoo.co.in in loop. The 5th International Poetry Festival invites writers and poets from all over the world. We aim to promote writers and their writings so we accept all forms, formats, and styles. However we give preference to innovative styles in poetry. For details, check at: Literary Partners.